Click chart for in depth premarket data. 1. Stock markets overview: U.S. stock futures are barely moving. 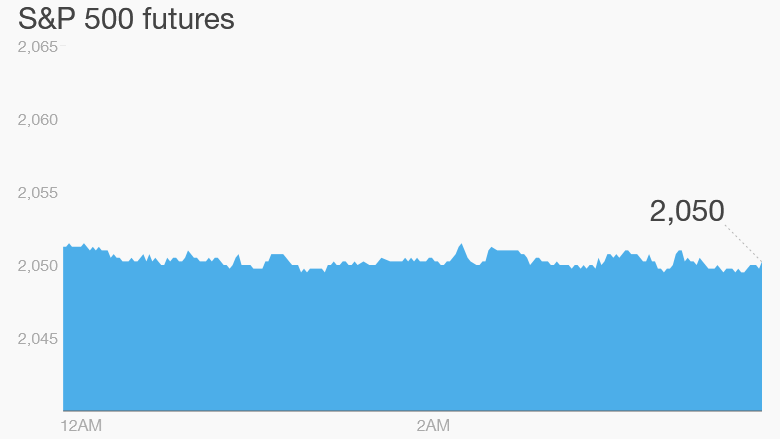 U.S. exchanges will close early -- at 1 p.m. ET -- for Christmas Eve and will reopen on Monday, Dec. 28. The few open European markets aren't doing much in early trading. Many will close at lunchtime, while Frankfurt and Milan are closed all day. Asian markets ended mixed. Japan ended down 0.5% after being closed Wednesday. Nike (NKE) fell 2% Wednesday ahead of a complicated stock split that will see its shares trading at a new price on Thursday. Nike has been a star performer in 2015. Bed Bath & Beyond (BBBY) is down another 6% in premarket trading. Its shares closed 4.5% lower Wednesday after weak third quarter guidance and an analyst downgrade. Keep an eye on Hyatt Hotels' (H) shares after the company suffered a computer hack. It closed 3% higher Wednesday despite confirming that malware was found in its customer payment systems. Celgene (CELG) was up 8% in premarkets after the biotech firm resolved a drug patent suit. The same news sent shares 10% higher Wednesday. 3. Commodities: Oil is trading around $38 a barrel, an increase of nearly 1% on the day. Precious metals are ticking higher. 4. Economics: The weekly U.S. jobless claims report is due at 8:30 a.m. ET from the Department of Labor. 5. Wednesday market recap: The Dow Jones industrial average and the Nasdaq each grew by 1%, while the S&P 500 rallied 1.2%.